Without warning, tire pressure has the possibility of dropping to 10 pounds per square inch (psi). Once this occurs, your fuel mileage will be reduced. Aside from that, it could cause your tires to wear out easily, risking failure when you drive at a faster speed. Instead of letting accidents occur, you should get the best tire-pressure gauge to bring with you when you drive. You could find this tool in various stores and retailers. Typically, it does not cost a lot compared to the mess you would encounter in case your tires break. In case you have a tire gauge in your gauge, you should check first if it is dirty or old. It is a better option to find a new one to ensure the reliability of the application. 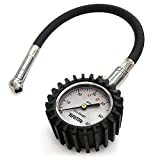 This tire pressure gauge is designed for cars and motorcycle. It measures 9.5 inches by 4.7 inches by 1.8 inches. The cumulative weight of the product is just 10.4 ounces. TireTek Flexi-Pro Tire Pressure Gauge has a measurement range of zero to 60 psi, which is ideal for any four-wheel or motorcycle. It is also constructed with a high-contrast dial and a larger dimension by two inches for easier readability. This tire gauge also has a swivel chuck that can rotate 360 degrees. At any angle, you will be able to read the measurement accurately. Air leakage will be prevented given its reinforced rubber hose. The TireTek Flexi-Pro Tire Pressure Gauge is built to last, supporting your regular check of tire pressure. Apart from the sturdy make of this tool, it also has a gear-style case boot. This keeps your tire gauge from damage in case of accidental knocks, hits, and drops. Furthermore, this tire gauge is made with bleed-through feature so deflation adjustments will be more precise and easier. Even without batteries, this fantastic tool can work dependably and accurately for a long time. The TireTek Flexi-Pro Tire Pressure Gauge is made by a manufacturer that is trusted for providing calibrated mechanical tools. This tire gauge is proven compliant to American National Standards Institute (ANSI) B40.1 Grade B accuracy standard. Expectedly, its above features are paired with the high cost. This tire gauge can measure from zero to 60 psi, which is recommendable for different types of vehicles. It is even claimed to be a mechanic-recommended tool. The JACO ElitePro Tire Pressure Gauge is marketed as a performance-tested tool and compliant to ANSI B40.1 International Accuracy Standards. This product has an accuracy rating of positive or negative two to three percent. This ensures that readings will be precise without the battery reliance. When used, you will notice that it is solidly built. 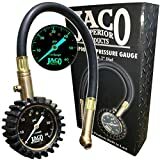 The components of JACO ElitePro Tire Pressure Gauge are constructed out of heavy duty materials. The overall structure of the product is also encased with a protective guard with a gear style. It even features an air hose protected from leakage, guaranteeing a hassle-free tire pressure reading. It has a glowing dial measuring two inches, which is still readable in the dark. Until you reset the pressure reading, the test will be consistently displayed on the dial. Aside from the the steel material, brass is also included in the construction of the product. Even if you accidently knock or drop it, it will stay usable. It is also designed for a more comfortable grip and easier handling. Though it is made of a metal case, the shape is perfected for excellent grip. Nonetheless, the internals will still be at risk if you drop any digital gauge. The product is capable of measuring tire pressure from zero to 60 psi. It comes with a face that visible even in the dark. Furthermore, it has a hassle-free release button for air pressure. The air pressure release button is added to the pressure gauge to remove excess pressure whenever present. Until the right pressure is achieved, the bleeding valve will continue working. It also has an Internal gauge damper. The Joes Racing 32307 Tire Pressure Gauge has a chuck sealing that is also easier given its swivel fitting. This component is made of chrome material for durability. If you want to change the ball chuck and angle thread, you may do so in just seconds. It is a heavy duty tire pressure gauge, ensuring that it will work regardless of how strenuous the work is. The reinforced rubber hose can extend up to 17 inches. The nozzles are made of stainless steel and brass for rugged protection. However, you should take note that Joes Racing 32307 Tire Pressure Gauge is not as compact like its counterparts. This is why it is highly recommended for pick-up trucks instead of regular cars. As recommended by experts, the operating number of this tire gauge is displayed in its dial’s center. Between readings, you will get a spot-on reading. It is also mechanical like other gauges, giving you no worries about battery replacements. From the name itself, you will know that this is a digital type of tire gauge. Though available with a display, it has a heavy duty construction ensuring resistance against premature breakage. The product also has a rugged design for longer use. This tire gauge can measure from five to 140 psi in 0.5 increments. The Accutire MS402B Digital Tire Pressure Gauge also has a coated handle and angled head. This promotes easier gripping and prevention of dropping the gauge in the internals. The LCD of the tool is sufficient to enforce readability no matter how little the light is in a place. To prevent deflation of tires, this tire pressure gauge is designed with an automatic shut-off. Unlike its counterparts, The Accutire MS-4021B Digital Tire Pressure Gauge is made of composite plastic, which may make its robustness a question. Nonetheless, it is still reliable for normal chores. Among the top objectives of the product is to promote your protection and savings while you drive with your family and friends. This digital tire gauge comes with a bright LED display that is powered by batteries. It is comfortable and convenient to use with a measurement of 5.9 inches by 1.6 inches by 1.5 inches. Its cumulative weight is 2.7 ounces. The Craftsman Programmable Digital Tire Gauge is made programmable for a more accurate measurement. You can easily read the measurement given its well-designed display. It also comes with a nozzle that requires a single push for function. 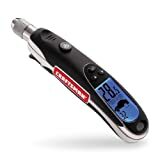 Similar to other tire gauge options, the Craftsman Programmable Digital Tire Gauge comes with an air bleed function. Exact pressure will be read. Once the measurement is done, you will hear a beep sound. Aside from its highly durable made, you will find its button coated with rubber for better depression. You do not need to press the button repeatedly when needed. This tire gauge has the capability to program one pressure only. Nonetheless, it is certainly accurate. You don’t have to worry about the power source since it comes with two CR 2032 batteries. The batteries included in the package will last for years. Even the replacement is hassle-free. You simply need to take off the little two crews beneath the tool. Unlike its counterparts, this tire gauge can fit in the valve stem. This is due to its longer and narrower neck. It can be placed right into the component without air loss. Digital tire gauge provides accurate readings to ensure tires are at their ideal pressure. Programmable to read for the target tire pressure of the vehicle. A straight-push nozzle makes the gauge easy to use. To find the best tire pressure gauge, you should be aware of the different tool types under this product category. You may have purchased your previous gauge years ago, making you unaware that there have been recent developments. The selection of the right tire gauge brand is difficult without narrowing your choices. To create a shortlist of tire gauge options, you should consider these types as your basis. 1) Dial Tire Gauge – This is often similar to a clock face tool, which is made of a dull needle to inform the amount of pressure. You will find it having an analog dial, but may also be packed with other features. For instance, it may have a shock-resistant dial, bleeder valve, or an extension hose. You will find this type of tire gauge easy to read. However, you need two hands to use the extension hose-assisted models. Expectedly, this is also bulky in size and expensive. 2) Stick Tire Gauge – You will find it in metal pocket pen-like structure. Inside the construction is a rod or bar. This type is simple to use and very compact. You can fit it in almost anywhere. Furthermore, it is less expensive than dial tire gauge. Nonetheless, it could be tricky to read if you are a beginner in using the tool. 3) Digital Tire Gauge – From the name itself, it is a more advanced type of tire gauge. It has an electronic LCD, which makes it more readable. Moreover, it is designed to resist dirt and dust for long. You will find this tire gauge handy in low light environments for some models may light up. Similar to the dial tire gauge, this is bulky. Its power sources are batteries, making it highly dependable anywhere. If you have decided to buy the best tire gauge, you must be able to identify one. Verifying if a product is the most reliable tire gauge is done by evaluating the important features of the tool. Apart from meeting or exceeding standards of a high-quality tire gauge, the product should at least comply with your personal preferences. 1) Accuracy – You should find a tire gauge with the high level of precision. Be reminded that even a mere change in psi can lead to inefficient fuel mileage and poor resistance to damage. 2) Readability – It is also important to find a tire gauge that is very easy to read. You may use the tool either in low or high light conditions. Stick tire gauges are often difficult or tricky to read. You will find digital tire gauges as the easiest to read among types of the tool. There are also releases that light up to make its display more visible during the night or when in low light environments. 3) Bleed-Through Feature – You should not only be concerned about the low level of tire pressure. It is also imperative to find a bleed-through feature in the product. This implies to allowing the air was bleeding out of the tire without necessarily detaching the gauge. Once the right amount is reached, the pressure level of the tire gauge will stop. This feature is highly important for tires that are overfilled. 4) Power Source – If your tire gauge is using the battery as the source of energy, you should know if it requires either rechargeable or replaceable batteries. The packaging of the product should also indicate the battery life. When possible, look for a tire gauge with a battery-saving feature, auto shutdown, and alerts for low battery levels. 5) Ambient Temperatures Resistance – The tire gauge should be able to work even at ambient temperatures without freezing or overheating. Its weather resistance may be determined by its construction. Check the Manufacturer’s PSI Recommendation – You should use the manual of your vehicle to check the PSI listing of your car. There is a figure determined by the manufacturer, which will tell if your tires are sufficiently inflated. Psi is determined by factors, explicitly recommended tire size, total size or weight, and towing weight level. Determine the Running PSI of Your Spare Tire – Even your spare tires must be checked for tire pressure. If there is a significant difference between the psi of your spare and existing tires, you may need to buy two tire gauges. Use Tire Pressure Gauge Regularly – To monitor the condition of your car’s tires, you should verify its pressure at least monthly. Do not settle with just one tire when checking for there may be varying pressure changes in each of them. Do Not Rely on Gas Station Tire Gauge – Other people no longer buy a high-quality gauge to measure their vehicle’s tire pressure. Even if you have stopped by a gas station to check your tires, still rely on your high-quality gauge with dependable reading. Store and Use It with Care – Never try to drop or carelessly store your tire gauge. Even if it has a protective covering, it may still be hit by different objects, affecting its accuracy. Find an area where it will not be damaged by harsh elements. Test Your Gauge Periodically – It is advisable to have dual tire gauges for periodical checking. By doing so, you can guarantee that the tool is still accurate. Its compliance to ANSI is also a guarantee that you do not have to be concerned about accuracy. Ease of use is also perfected by the tool’s manufacturer. Each component helps in promoting readability and easy handling of the tool. Although it is valued higher than other tire gauges, its features are worth every penny. You do not even need to rely on batteries since it works mechanically. Regardless of the weather or environment conditions, it will never let you down.